The year 2016 is the Year of the Monkey (also the year of Bingshen) according to the Chinese lunar calendar. 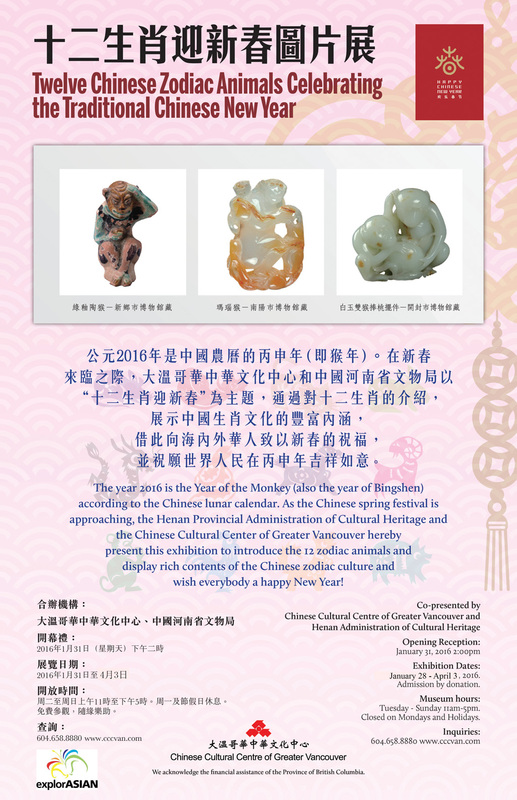 As the Chinese spring festival is approaching, Chinese Cultural Center of Greater Vancouver and China’s Henan Provincial Bureau of Cultural Heritage co-present an exhibition titled Twelve Chinese Zodiac Animals Celebrating the Traditional Chinese New Year at the Chinese Cultural Centre Museum during January 31st to February 28th. The 63 bilingual panels of the exhibition illustrate and explain the history of Chinese zodiac animals and traditions. The content is enriched by photos of the excavated artifacts such as clay, jade and bronze zodiac animals in Henan Province. This exhibition is entertaining, instructive and family friendly. The exhibition is in both English and Chinese. Henan Province in China is one of those most important cradles of Chinese culture and has long served as the national political, economic and cultural center. It preserves a host of cultural relics themed on the Chinese zodiac and passes down the zodiac’s cultural tradition. From clamshells with designs of dragons and tigers in the Neolithic age, to today’s folk custom of uncles sending lamb-shaped food to nephews in the sixth lunar month every year in Northern China, all those aspects are embodied with the charm of Chinese zodiac culture. Tags: Chinese Cultural Centre, events, Henan Administration of Cultural Heritage, Year of the Monkey. Bookmark the permalink. Previous post ← VAHMS is Now Accepting Event Submissions for explorASIAN May 2016!